Line a cookie sheet with parchment paper or lightly spray with cooking spray. Step one: empty an entire container of Porta Mangiare Biscotti mix into a large mixing bowl and make a well in the center. Into the well, crack two eggs and add 1 teaspoon of pure vanilla extract. 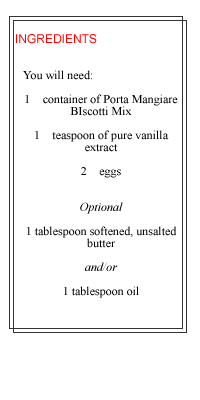 Options: To make the Biscotti more crunchy and less dense you may also add at this point 1 tablespoon of softened, unsalted butter and/or one tablespoon of cooking oil. These variations change the crunch of the finished cookie by degrees. 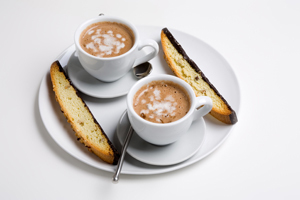 The traditional cookie made in Calabria only had eggs, and occassionally some oil. The addition of butter really lightens up the crunch. Experiment! Step two: Using a wooden spoon mix the ingredients in the bowl. Have patience; after a little while the ingredients will "cream" together and the dough will become a little sticky - especially if you added the oil and butter. Options: At this point you can add almonds, walnuts, chocolate chips, dried cranberry bits or any other additive you like. Also, you might get better results at this stage if you finish the mixing by hand. Step three: Once the ingredients are mixed into a sticky dough, divide it in two parts and roll each into a log about 14 inches long and 1-2 inches thick. Place the two logs onto the cookie sheet leaving some space between them. They will rise just a little during baking. If you put a little flour on your hands and on the work surface, the rolling will be easier. Take a look at the video to the left for how its done. Step four: Place the cookie sheet into the oven and bake for 25-30 miniutes at 300 degrees. Then remove from the oven and let it cool for 10 minutes. After this first bake, the logs will still be a little soft on top, but a toothpick inserted in the middle will come out clean. Step five:- After cooling for a few minutes, using a serrated knife, slice each log on the diagonal - half inch slices - to get about 12 cookies from each log. Place the cookies back on the cookie sheet, standing up if possible, and back into the oven for another 20-25 minutes or until they just begin to turn golden brown. Remove and cool. The cookies will keep for about 3 weeks in an airtight container. Option: When the cookies are done, you can dip or coat them in melted chocolate for a professional finish. Check out the video at left for step by step instructions.